Did Walter’s cancer really relapse at the end of Breaking Bad — or is it possibly his lie, to justify his behavior? When Walter first got cancer at the beginning of Breaking Bad, we see medical evidence, and also have no reason to question this being true. Same when the cancer goes away: Walter’s anger — caused by the cancer gone — is understandable given his new situation. Towards the end of the show, however, we learn about cancer relapse only via Walter, who has in the meantime become a character who is not afraid of lying, or much worse. Interpretation 1: The cancer relapses. All the way from the beginning, Walter knew he had nothing to lose, and this gave him the motivation to have no fear, and while first the cancer went away to extend his adventures, the show, and add a curious twist; after all the same end finds him that he expected from the beginning, and the gunshot is just a graceful way of dying instead of waiting for the cancer to finish the work. Interpretation 2: The cancer is gone for good and Walter lies that it relapsed. This is a transformation story beyond a point of no return: Walter first thinks that the cancer gives him nothing to lose, triggering his transformation to a criminal. However, even though the cancer goes away, he is now unable and/or unwilling to return to normal life, getting excited about “the empire business”. When he realizes he has no chance to survive freely long, he lies to his family about the relapse, so he does not have to face their blame that it is entirely his responsibility that he dies early. It is heavily implied in S5E8 "Gliding Over All" and later we see evidence in S5E9 "Blood Money". He is seen taking a medical scan after which he seems resigned. Later he is seen in chemotherapy, vomiting, and taking Dolasetron which is an anti-vomiting drug prescribed to patients who are in chemotherapy. In episode 8 we see him go through another medical scan after which he is seen in the bathroom washing his hands. This scene mirrors the previous scene when he finds out his cancer is in remission, and he punches the paper towel dispenser. The present scene calls back to this moment when Walt notices the same dispenser is still dented. However, this time rather than being frustrated he seems calm and resigned. His resignation is also shown later because finally gives in and agrees to stop cooking meth after Skylar shows him the pile of money in the storage locker. He no longer has a reason for cooking, not just because of all the money, but because he's just found out he is back on track to die soon and wants to live the last days of his life with his family. In the next episode, it is more explicitly shown that his cancer has relapsed. 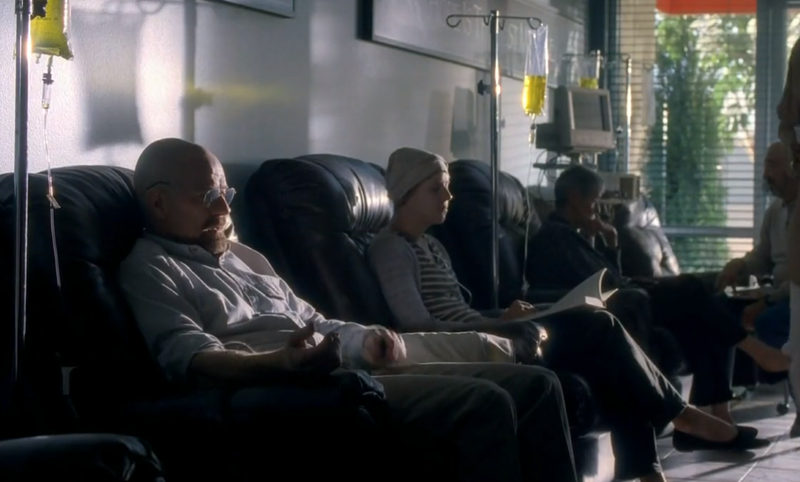 After Jesse leaves the $5 million with Saul, Saul calls Walt and we see him sitting in a chair among other cancer patients receiving chemo-therapy. You could certainly argue that chemo treatment is sometimes a part of maintenance treatment even when in remission, but this scene is very deliberate on the part of the film makers. We also later see him vomiting in the bathroom and taking some prescription pills which he has hidden under the sink. 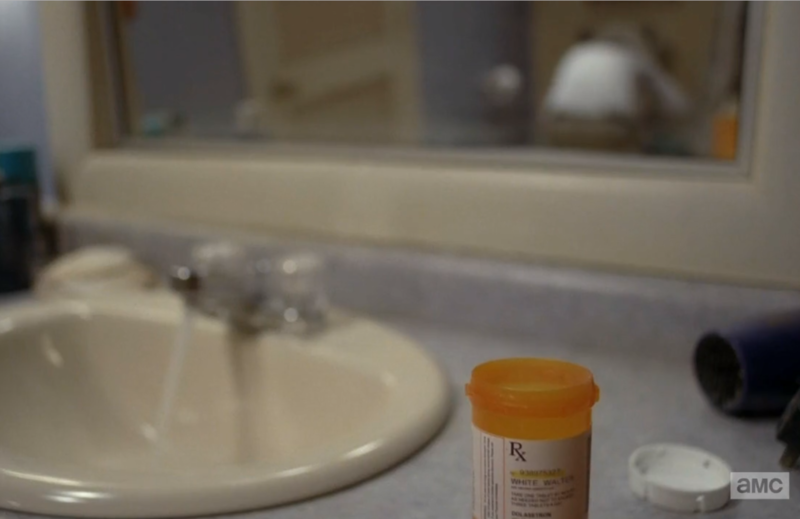 It is blurry but the pill bottle appears to be a prescription for Dolasetron. Dolasetron is used to prevent nausea and vomiting caused by cancer chemotherapy. All of these scenes are purposeful and deliberate. We haven't seen Walt receive any kind of treatment for his cancer since his surgery and are meant to understand that his cancer has indeed relapsed. Not the answer you're looking for? Browse other questions tagged breaking-bad . What happend to Walt's Aztek at the end of Breaking Bad season 4? How does Walt deduce that he was the prime target of the Cousins? Was there ever noticeable criticism about Breaking Bad possibly glorifying the drug business? Did Walter White's poor choices lead to his downfall? Did Vince Gilligan or other major Breaking Bad participants acknowledge the Wire as an inspiration? Did any Wire people comment on Breaking Bad?